Diamondback Tactical 4-12x40 is rated 4.9 out of 5 by 68. Rated 5 out of 5 by Bigman outdoors59 from Perfect scope Last fall my my wife and I had the opportunity to go hunting antelope for the first time. About a week before the hunt started the scope on my wife’s gun broke and I had to replace it fast. I ordered a diamondback tactical 4-12 and told the folks I was on a real crunch for time and they helped me out big time. I had the scope fast and we got it set up in time to go out opening day. The scope zeroed fast and and held true. As we’ve played around with it it tracks great and is very clear. I’ve shot out to 700 yards with it and been on an 18 inch plate every time. This is one of the best optics I’ve ever played with for the price point. Can’t recommend higher. Rated 1 out of 5 by Old Vet from Diamondback disappointed Disappointed in the diamondback tactical. First off I like many of the Vortex products with exception and this is one exception. The turrets and mag ring feel cheap. The clicks are hard to discribe, Almost like plastic gears. Tracking adjustment is faulty. Can be several clicks before reticle moves at all, somerhing is seriously wrong, and Defeats the whole purpose of exposeded turrets. 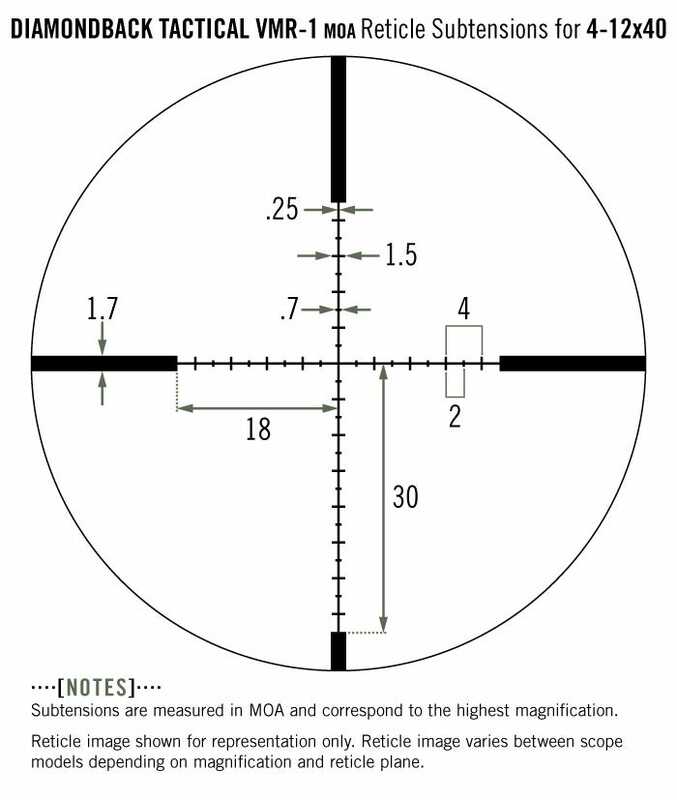 Not having adjustment for parallax on a scope designed to be dialed for distance ( when parallax becomes an issue ) just seems silly. The glass is ok for the price but the other shortcomings especially are shamefull. Not sure what the idea was behind this model, But this one is a fail. Rated 5 out of 5 by Mza13 from Great value at this price range. Been debating on a scope for awhile now and what I wanted in it. After much thinking and a few words with my local Shop, I’ve decided to go with the Diamondback tactical over the crossfireII and other scopes on the market as to where a friend stuck with the crossfireII (Both of us were lookin for scopes at the same time) and man I’m so glad I went with this scope, Solid clicks and easy adjustment, love the oversized knobs and make adjusting a breeze. Glass is clear and crisp. Very sweet scope for the Price. Obviously it’s got a fixed parallax and no objective focus but at this price point it does not bother me at all. Just takes a little more work and it’s good. Rated 5 out of 5 by Jrod from Great scope !!! I currently own a PST for my long range gun and it became too heavy to hunt with. So I purchased a Savage 10 in 260 rem for my new hunting rifle. I wanted what i have come to love in my PST 6x24x50 but in a smaller package. The Diamondback Tactical is a perfect fit. I mainly wanted turrets so that I wouldn't have to bother with removing the caps when out in the field. Turret adjustments are solid, easy to zero, and very easy to read. First time out after the scope was zeroed i wanted to see how it would do. I set up and shot 500 yards and was on target in a few shots... moved out to 800 yards and got hitting consistently. Now for the test.. went from 800 to 500 and back to 800.. shot 3 rounds at 500 and adjusted back to 800 for 3 more. All 6 shots hit just as they did before. Was very satisfied with just how well the scope tracked between different yardages. Lens clarity is as clear as my PST. Great job with this scope Vortex !!! Rated 5 out of 5 by Mike W from Great Turret Scope I was building a AR for coyote hunting, and decided to see what I could "get away with" in terms of scope/price. 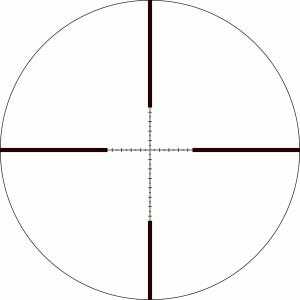 I came across this scope after watching vortex's ruger american rifle video with the 1000 yard shot. This thing has all the features of any high end scope, and functions flawlessly. Makes 600 yard shots with my .223 easy. Turrets are dead on using Vortex's LRBC. Smooth turret adjustments, super easy to zero, clear glass. Would buy again without hesitation. GREAT for the price. Rated 5 out of 5 by Yarnac from Excellent Bought this as a cheap stop gap before I bought another Viper PST. I honestly do not think I would change now. Very sleek tube with no fuss. The zero-reset turrets are first class. I regularly shoot at 100m to test my new loads but dialling back up to 750 metres for my regular loads never fails. A 6 - 18 x 50 (still with the same turrets) would be welcome.. I prefer the DB T to the Viper PST now because of it's simplicity. Rated 5 out of 5 by Scott68 from Great scope I was looking for a scope that would hold up to mid range shooting. I knew that I'd be using this item for bench shooting and hunting. I zeroed the scope at 200 yards, because I'm shooting a 6.5 creedmoor 140 grain bullet. I was shocked with the clearity of the glass and the quality of this scope. The turrets turn fine with no problem. Very distinctive clicks when adjusting for windage and elevation. I wear glasses, (bifocals) so i was concerned about the eye relief. Much to my surprise, i haven't had any issues acquiring targets. Overall, the scope is worth the money and the warranty is the best. Great solid scope. Eventually, all my rifles will have the diamondback on them. Rated 5 out of 5 by Chris from Excellent performance and an Excellent Value! I acquired this scope to replace an old scope on my primary hunting rifle. I researched the scope's features and was intrigued by the simple turret controls. The clear glass, waterproof and shockproof features and the best warranty in the business were all features I really appreciated. It all came down to its performance on my first buffalo hunt. The Diamondback tactical 4-12x40 worked to perfection. Bullet placement was critical because I had to take a head shot. I simply adjusted the turret and took the shot. The result: One shot, one buffalo, no damaged meat.